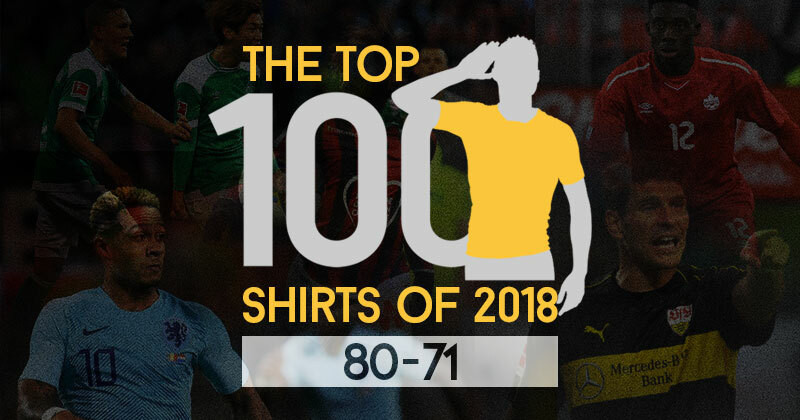 Firstly I want to say a big thank you to all those who have read, shared and commented on #Top100Shirts so far! It’s been incredibly encouraging to see the response, and to see big accounts and even clubs themselves engage with the content is amazing. But anyway, you’re here for the next 10 on the list. This section has a distinct German flavour to it, with the Bundesliga making their debut and bringing 3 shirts to the party. If you think any of these shirts don’t deserve their place, let me know on Twitter. I might agree with you. You cannot go wrong with red and black stripes on a footy kit and Macron have done well with this effort, despite it looking like an AC Milan tribute. 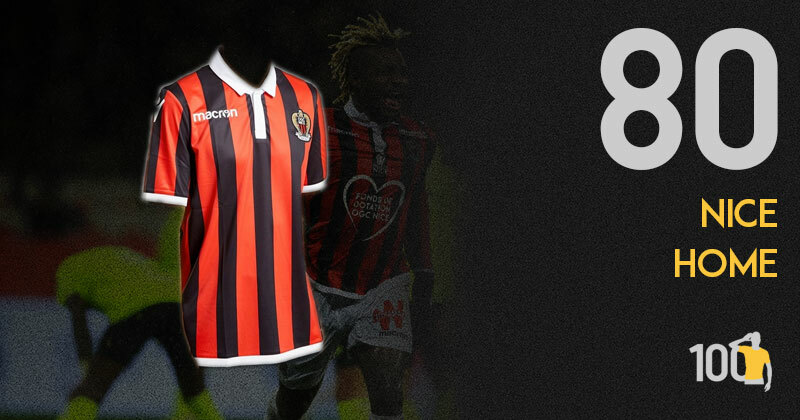 The black and red stripes are a nice width and the badge is a magnificent size (I do enjoy a big badge on a shirt). I am still not sure about a white collar but that seems to be a tradition: which is one of the things that makes it so similar to an adidas AC Milan shirt from a few years ago. The white hem is a nice touch and I am delighted that the stripes extend the full length of the back: as all striped kits should be! Another sponsor-free shirt that looks all the better for it, this red and black piece from the French giants has a definite retro feel - Nice’s crest itself features bold eagle imagery that is reminiscent of old Coats of Arms that used to adorn most shirts. The stiff Polo collar really rounds it out as a classy and majestic piece, which the likes of Balotelli, Dante and Cyprien have been rocking in serious style so far this term. Macron, once again, showing themselves to be serious players on the world stage when it comes to shirt manufacturing. Two colours. That’s all it takes to create a beautiful shirt. 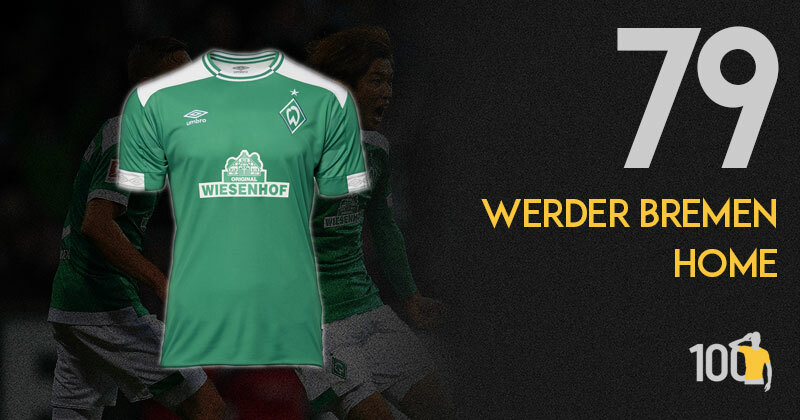 The Werder Bremen home shirt is green, white, and a perfect example of the importance of sponsor integration. After 6 years of shirts laboured with a largely red sponsor it’s completely disappeared this year to great effect. This is a pleasing shirt to look at and the kind of considered design which I would argue is beginning to return to the football shirt world in a big way. I am a big fan of Umbro’s efforts this year. Werder had a slightly pedestrian Nike home kit last year but the cross over to Umbro has brought a touch of class to the German giants. A beautiful shade of green with white shoulder panels is topped off by a wonderful two-colour retro collar and some similarly old-school cuff trim. The back of the shirt carries the title of their eponymous hymn Green and White for Life which finishes a simple but effective shirt with an individual flourish. 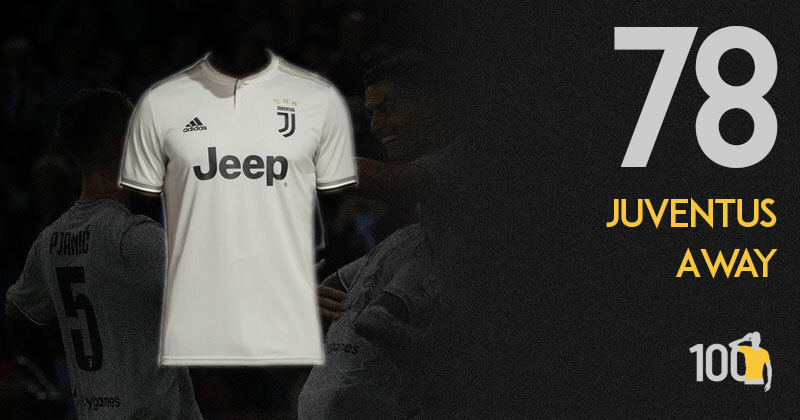 The saying ‘Less is more’ really does apply to Juve’s away kit. The colour scheme isn’t overly bright like some of Juve’s previous away kits, but it’s still extremely refreshing to see them be brave with colours. The detail on the end of the arms really help take it to the next level. Ehhhhhh. Average. The few highlights of this shirt are the stripes on the shoulders and sleeves, which give it something extra. Otherwise it’s a relatively bland grey colour, with little else to discuss. I have a soft spot for the late 90s, when Nike entered the fray and brands started to simplify things. This Stuttgart shirt has a bit of a Brazil ‘98 about it, with it’s piping down the sleeves and a gorgeous gold used as a secondary colour. In tandem with this retro style, we have a strong central band, a marl effect (a regular feature for Puma shirts this year) and a subliminal stallion. Quite simply, we’re completely spoilt by this shirt and if I was solely in charge of this list, this would be knocking on the door of the Top 10. A kit that otherwise would not be anything to write home about, Stuttgart’s third strip sneaks into our top 100 thanks to the grey stallion elegantly inserted into the bottom left of the front of the shirt. Large animal branding seems to be a big trend at the minute and I am 100% here for it, long may it continue. 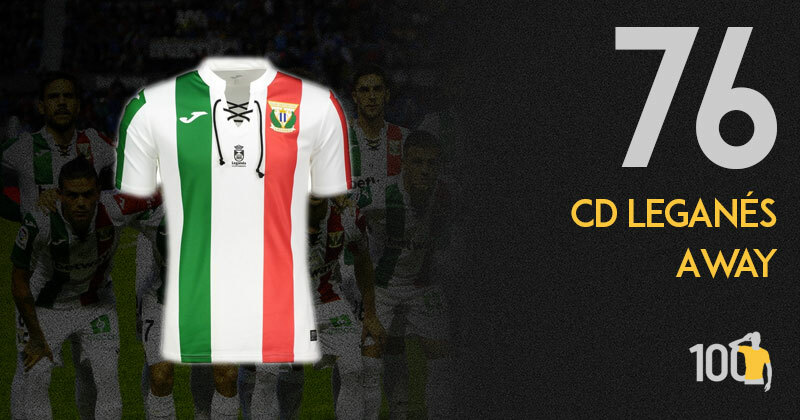 CD Leganes are celebrating their 90th anniversary with this fantastic away shirt. The shirt pays homage to club’s beginnings with various details. The colours and club badge are the same as those used shortly after the club’s formation and to further add to the retro look, the shirt uses laces on the neck, reminiscent of shirts worn at the time. I absolutely love this shirt. The laces, the grandad collar, the sleek cut of the shirt, the stripes being different colours on either side of the shirt… everything! Another shirt with a nod to days gone by is Leganes away strip, which honours their 90th anniversary. 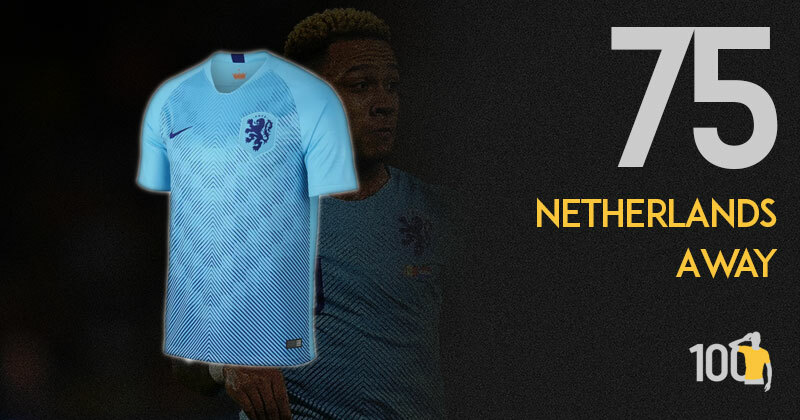 If you were to dive into the archives of the Netherlands away shirts in recent history you'd be treated to a masterclass in shirt design but personally I think this tops the lot. The kit employs a gradient style on the front in a gorgeous turquoise colour that (I believe) isn't seen enough on football shirts these days, and is rounded out nicely with dark blue tints to the KNVB and Nike logos. A majestic effort from a team that has been quite the opposite on the field in recent years. Nike were rightly panned for their appalling efforts at Euro 2016, where several teams had kits that might as well have come out of a teamwear catalogue. As a result many people still default to the “same old boring Nike” line. This couldn’t be further from the truth this year. Netherlands are one of many nations who have benefitted from unique designs, and this is one of the best. The line-based, checkerboard gradient design has a little bit of ‘88 about it, and the two-tone blue colourway works very well. Canada’s national flag is a proverbial goldmine when it comes to designing sports kits and Umbro have once again not disappointed here. The famous Maple-Leaf is repeated on the shirt in a V-like pattern on the front, in a glossy manner that whilst definitely noticeable is subtle at the same time. Interestingly, this shirt also features a small soundwave of the Canadian National Anthem printed on the left hip, in a nod to the Great White North’s faithful fanbase. An all round delightful kit. Another quality design from Umbro who are mixing a bit of retro-chic with some fantastic unique detail. 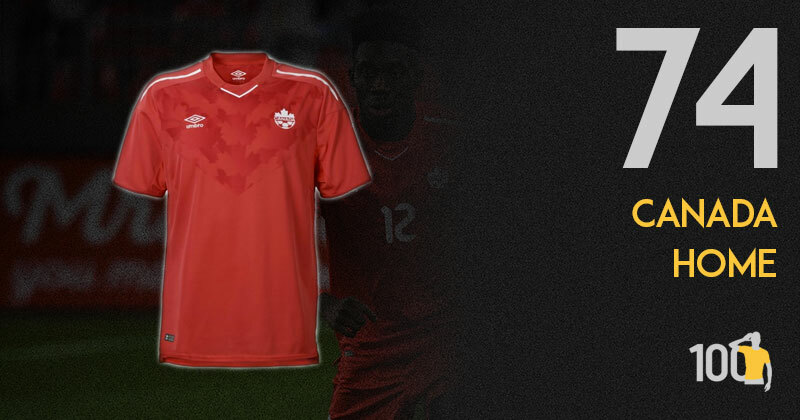 I love this Canada home shirt. It is a fairly simple shirt with a middle chevron full of wonderfully tessellated maple leaves in a multi-shade shadow pattern. And my goodness it works well. Coupled with the retro-inspired collar, minimal white trim and a badge that screams 1970-style, it is a brilliant design that works brilliantly. Despite actually being worn at the World Cup in their game vs Sweden, this shirt for the large part seemed to have slipped under the radar. Mimicking the colours of their national flag, this shirt features a red and blue striped design down the centre of the shirt, in a way similar to that of a Tiger; the animal featured on the Taegeuk Warriors crest. A welcome wander away from Nike’s usual template has resulted in a contemporary and innovative effort that in my opinion should be much higher on our list. This years world cup was really one where the brands came to make a statement and Nike did just that with this kit. 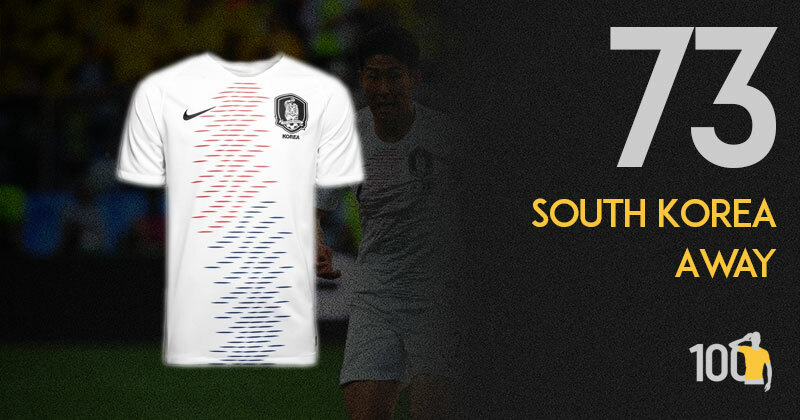 Inspired by both a tiger pattern and the Taegeuk symbol from the flag, South Korea’s away kit is both simple, but perfect. A kit that is nearly impossible to fault. That colour! What is it? Mint green? Whatever it is a lovely hue that is a real departure from traditional Bayern away kit colours. It particularly compliments the waffle texture of the material and is contrasted by the dark grey three stripes across the shoulder. I don’t usually like single colour badges but it works very well here. 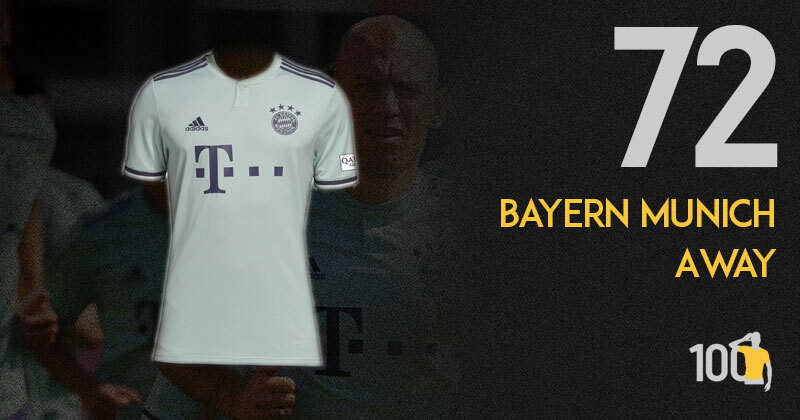 The single button grandad colour gives it a retro tip and I love the nod to Bayern kit history with the club’s name on the back. With Bayern announcing they will only have rot-weiss home hits from now on, expect more away kits to push the boundaries in future years. It physically pains me how low this shirt is on this list. What an absolutely beautiful kit, truly one of the best in Italy this year. The wine colour alone is lovely, but the true gem of this shirt is the subtle triangular pattern, with the classic Torino bull featured in the middle of each triangle. Thank you, Torino, for this stunner. Kappa have always designed beautiful shirts. The problem for me is that they always seemed to be a bit too ‘figure-hugging’... fine if you’re a top-level athlete, not so fine for those of us with a more ‘rounder’ figure. 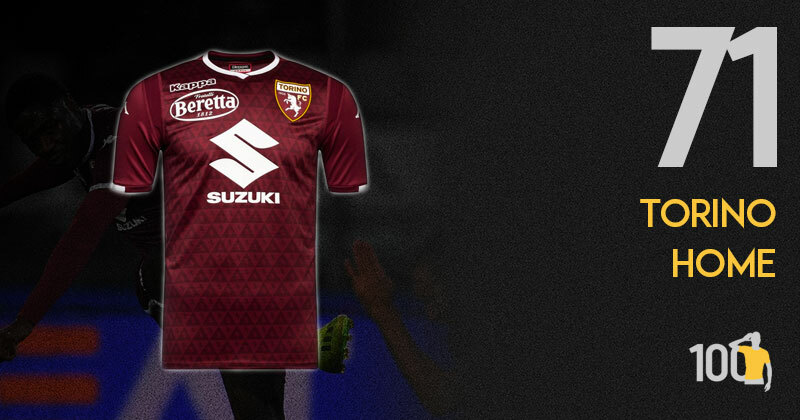 Nevertheless, there is no denying the beauty in Kappa’s shirts and this Torino shirt is no exception. The vivid club badge sits on a beautiful, deep-red background which is complimented with white detailing on the collar, sponsors and side panels. The background itself is the star of the show, as little silhouettes of the Torino bull are subtly stamped across the shirt. This is one of Serie A’s best shirts this season. Superb from Kappa. Thanks for reading Part 3 of our countdown.